An afternoon trip by the ship for non-divers around the island MURTER 15 EUR/os. 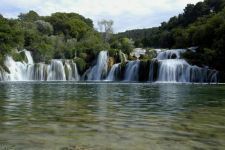 The tourists that spend their holidays in the Dalmatian part of the Adriatic coast usually do not miss the opportunity to visit "the waterfalls of the river Krka", as Czechs often call the largest waterfalls on the most extraordinary karst river of Dalmatia Krka, the actual name is the Skradinské waterfalls. They are really impressive. They have 17 travertine terraces through which the water with the volume of 55 m3 per second in average dashes down into the depth of 37,5 m forming a set of cascades and waterfalls. The waterfalls are a magnificent sight throughout the whole year, nevertheless, they are largest in the end of spring when there is the highest volume of water (the river Krka has enough water throughout the whole year due to its surface and underwater resources). Even though the Skradin waterfalls themselves are worth visiting, they are only a small part of what the river Krka can offer to tourists. The city and port Zadar, main center of Northern Dalmatia. 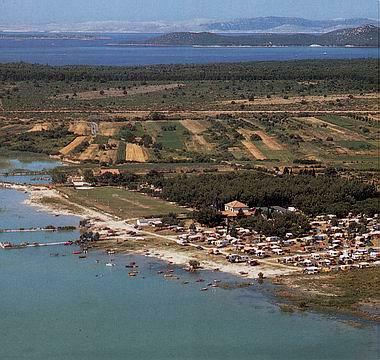 Zadar lies next to the Adriatic Arterial Road. It is an important ferry port, among others the main point of departure of ships to Italian Ancona; also the central point of departure of voyages to Northern-Dalmatian islands. Two yacht ports - marinas: Borik and Tankerkomerc. A fertile background, abundant flora. In winter, it suffers from cold winters from the interior. The famous production of liquors, among others the liquor maraskino. The old part of the city is extended over a small peninsula. In the 16th century, in the time of the greatest Turkey danger, the isthmus was dug trough, so that the arisen ditch was flooded by the sea. In the time of peace, the ditch used to be covered up again by soil. 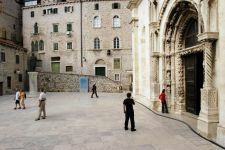 The city itself is one of the most attractive places in Dalmatia, due to its numerous precious historical and cultural monuments and due to its cultural facilities. The city and the port Sibenik in Northern Dalmatia lies near the estuary of the river Krka to the sea, in the Sibenick bay. A significant industry is centered in its margins (processing of colourful metals, textiles, food industry, construction of ships). It also has an agricultural surrounding. 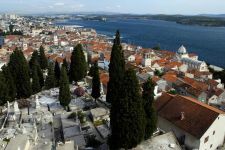 ibenik is a significant center of tourism with many excellent monuments. The Sibenick cathedral of St. Jacob (Sveti Jakov) was registered in the list of the world's cultural heritage of UNESCO in 2000. Sibenik is also an important traffic junction, crossroads, railway connection to the railroad ZáGREBeb - Knin - Split, for ferries heading towards the near islands. 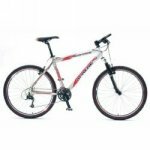 It has a protected position and a high number of sunny days. Due to its size of 30,8 km2, it is the largest lake in Croatia. It originated after flooding of the karst polje by underground paths to Persian bay. The lake is separated from the sea by a narrow and elevated stripe of land isthmus - with the length of 13 km. The most suitable access is from the village Pakostane or from the little town Vrana in the interior. The Arterial Road leads along the narrow isthmus between the seam and the lake. 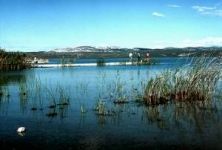 The Vranské lake is originally freshwater lake, but in relation to the fact that it is connected to the seam, its water is slightly salty. In this brackish water, many freshwater fishes but also sea fishes live. The lake is famous for its great variety of fishes (carps, pikes, eels etc.). If the tourist is interested, he/she can purchase a permit for fishing for one day or for longer time in the local tourism bureau or even in the local tourists association. The local restaurants are known for their specialties from eels and other kind of fishes.